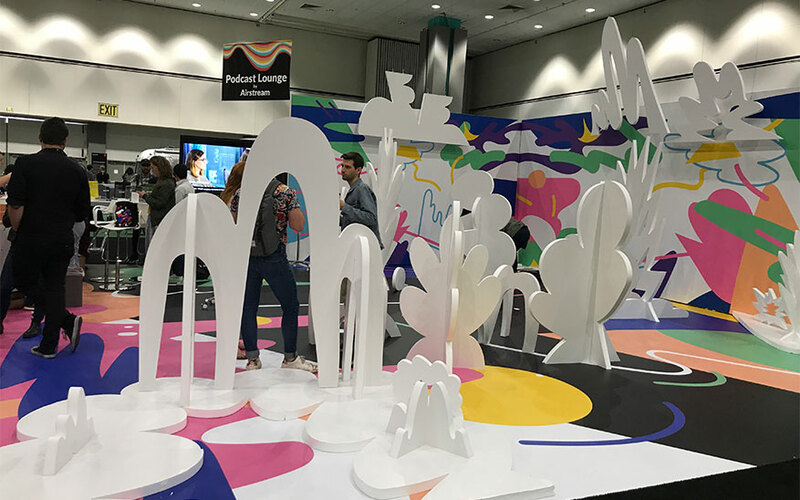 With a proposal of exhibiting a creative conference that would allow people to “Get inspired, Learn Skills, and Play,” Adobe Max initiated its extensive 2018 conference which took place at the Los Angeles Convention Center from October 15th to 17th. The event offered a vast number of options for everyone in the design community from graphic, web, or UX designers to photographers, illustrators, and those not in the design community like business strategists. According to the 2017 Adobe Max survey, the event provided more than 300 sessions, workshops, labs, and pre-conference events, resulting in 96% of the people who attended learning new skills to apply to their work and 95% were inspired to build innovative projects. Although the conference’s central theme revolved around Adobe products, the speaker’s session provided much more than that. They provided a broad array of information regarding design systems, design voices, design for social impact and much more. From the perspective of a UX designer, the information dispensed in the sessions was extremely important because it not only served to make me more aware of what is going on in the tech world but it also truly inspired me to collaboratively design for change as well. 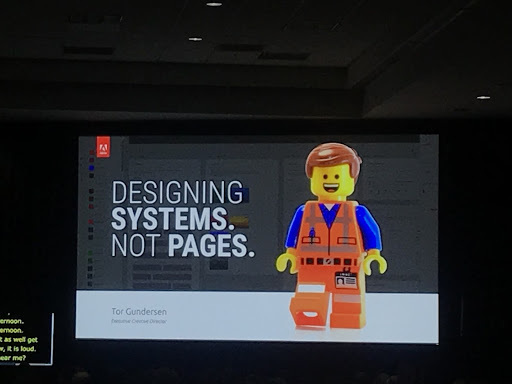 It seemed like the biggest topic of the conference was “design systems.” Speakers like Tor Gundersen, Executive Creative Director of Perficient, presented a very compelling case with “Design Systems, Not Page,” where he explained that we must design pages or apps as a whole, rather than individually. He claimed that by doing that we will not only create a consistent user experience, thereby creating an asset for the business, but it will also speed up the time to market. According to Mr. Gundersen, the main idea behind the Design System is the principle of Atomic Design, which is a hierarchical methodology based on the idea that design should start as atoms, to become molecules, evolving to organisms, moving to templates, to then become pages. With that, the system then has all the pieces necessary for the creation of the whole, just like a puzzle. Although design systems are based on the Atomic Design principle, as Gundersen explained, they are not the same. In order to create a real Design System we must put together all the atomic elements and join those with the branding, the visual style, as well as guidance and governance. While we can easily identify “branding” and “visual style,” it’s important to note that “guidance and governance” consists of accessibility, content fitting, CMS mapping, image sizing, naming conventions, and component lifecycle. To conclude, the “Design System and Not Page” presentation, Gundersen urged designers to understand we must change the mindset that we are not designing standalone pages, but rather an idea of designing as a much larger aggregate. Other Design System speakers, Sherif Assaf, Product Manager from Adobe and Cisco Guzman, Product Manager from Adobe XD, took another approach, exhibiting how to easily design a system employing Adobe XD. They demonstrated how to fully utilize Adobe Cloud in conjunction with Adobe XD in order to quickly create an entire system. 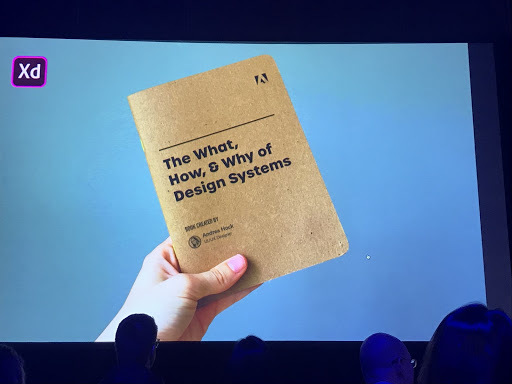 In that presentation Cisco Guzman gifted us with a great surprise: everyone watching that session received an extremely practical little book called “The What, How, & Why of Design Systems,” created by the very talented Adobe Creative Residency, Andrea Hock. The book is simple, well crafted, and very helpful for everything, or at the very least, almost everything we need to know about design systems and is available for purchase here. 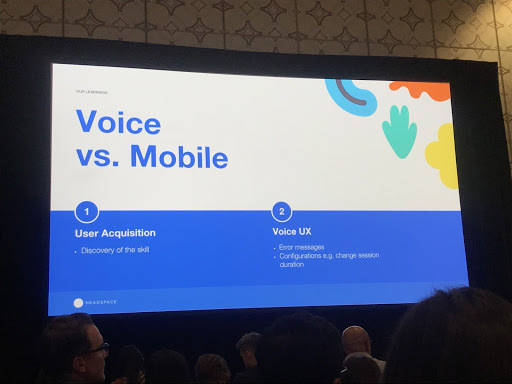 Design Voice was also another big topic at the conference; Andrew Howlett founder of Rain, and Randhir Vieira, VP of Products at Headspace, presented a lot of stats on how Design Voice is quickly growing in the tech world. They mentioned that “30% of our interactions with technology will be through conversations by 2018” and also that “50% of all searches will be by voice by 2020.” In my view, considering AI’s advances and the world’s demand for immediate results, that last quote seems a bit modest. One thing I could not help but notice at the conference was that there was a palpable excitement in the air and people seemed thrilled to be there.. The highest concentration of people were gathered at the Community Pavilion, where they participated in games, watched mini-workshops at the booths, and lounged in the very cute and comfortable resting areas called “Creative Park.” Adobe certainly held a successful creative conference where people were either writing on the walls, competing for best designed illustrations at the booths, collaging or participating in collaborative games. Another takeaway from the experience was how deeply Adobe cares for and about their users, they truly went above and beyond to ensure that everyone was considered and went to great lengths to meet and exceed expectations. I spoke with different people who shared stories on how Adobe had resolved complaints and dissatisfactions for them and I have to confess, I was impressed with their genuine interest and thorough execution regarding problem resolution. One of the designers I met, shared a story about an Adobe Application used by his company and there was an issue with it. Once he posted their dissatisfaction on Twitter, within five minutes a representative from Adobe contacted him and not only resolved the issues but also invited him to the conference, all access and all expense paid. The extent that Adobe went to take responsibility for the glitch is exactly what User Experience is all about. There were also online complaints regarding parking and an Adobe representative was right there to reply to the messages either apologizing, offering a better solution, or to consider other options for the next event. Since Adobe seems to be very interested in reflecting on the past to create a better event in the future, I would offer that my only complaint with the conference was regarding no strong sense of networking. Although it was evident they are aware and working on the networking portion of the event, it was not yet entirely successful. They created an app where we could connect and talk to people at the conference, but it was an alphabetical list, which became overwhelming and a bit intimidating to connect. They also created events with the intention of establishing a network such as “VERGE: The Exclusive Party for Students,”and the “Max Bash,” but none of them appeared to be very effective for this purpose. The best networking time we had was during one of the sessions where the speaker Amelie Lamont, while presenting “Defining Your Design Journey” made it mandatory for people to talk to and find some connection with each other. I found it to be so enjoyable that it made me even more aware of the fact that there really was no intrinsic networking otherwise. It was my first time attending the Adobe Max Conference and it surely is not going to be the last, I highly recommend it! It is definitely a great place to find what is cutting edge regarding technology: please check the Sneaks 2018, it’s just mind blowing! Adobe managed to compile all manner of information to satisfy every sector of the design field. If nothing else, after breathing three days of artistic air, it inspires one to continue their path and gain certain affirmation that they are doing the right thing: after all we are all working to transform a very complex world into a somewhat more comprehensive one. © 2019 UXPA of Los Angeles. All Rights Reserved.